West side. Say it with me brother, west side, ayeee. Respekt. Yo yo homeboy, where s’your crib boy? In da hood on da west side homie… fo’ sure. For aeons and onwards there have been East vs. West sparring matches, and here on Australia’s island state, Tasmania it seems to be contested in a bloodless bout of beauty. Tassie’s west coast is a region borne on the rim of mines, where mining towns remain eerily quiet allowing an irregular chugger of tourist’s campervans to retrace a route of history. 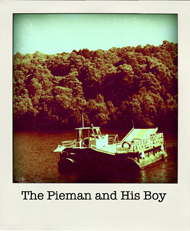 To enter the region we chose to cross the Pieman River on the wonderfully named and cheerfully operated Fatman Barge. I love that name, I still do, in fact I always will. Why did the Fatman cross the river? To get to the other side. No no, wait. What did the Fatman say to the Pieman? Maybe that can be a caption competition. Regardless, I just wanted to instil you with my happiness at having floated on a Fatman across a river. From there it was a sweeping road through to Zeehan, a one-wallaby town complete with, complete with, complete, with. 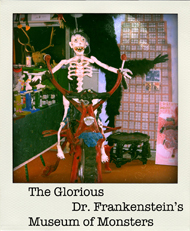 Well, almost incomplete you might say unless like me you’d visited perhaps the world’s best independent museum; Dr. Frankenstein’s Museum of Monsters. Now, I have to reiterate, I’m in the middle of nowhere. Wholly created by the bashful Mrs Monster the little known museum is a sizeable barn stuffed from dark corner to ghoulish rafter with gorgeously grisly creatures such as killer koalas and kiwi fruit mice. 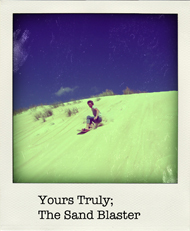 To give some perspective to Tassie’s diverse attractions my next stop took me to Strahan, plonked me on a vast sand dune and whacked a sandboard (think snowboard) onto my feet to provide a chilled afternoon of monumental (and accidental) stunts. I looked like the Samiad on speed – marginally better than my weeeeee shrieking mother, my wooooooooah belting father and my aeeeeeiiiiiieee gibbering girlfriend, Reb. All this came in the no-man’s-land of the massive Henty dunes where the only signs of life were fading 4×4 tracks and a gingerbread trail of wallaby footprints. From Strahan we leaned our attention to the drive eastward, through the muted mining town of Queenstown and onwards through the mighty Franklin Gordon National Park where we overindulged on whinging waterfalls, moody lakes and show stopping panoramas. There was in fact so much nature that I feared I’d develop a phobia that it was somehow following me. This was heightened, quite literally during one of numerous bushwalks beneath the superior gum trees of the Mount Field National Park where the sturdiest have survived numerous bushfires to tower 70m above the lush, shimmering damp of the forest floor. Tasmania’s forests are some of the most typical adverts for the cycle of life I’ve seen since the north Sumatran rainforests. If Tasmania is anything, it’s consistent. Consistent in brilliance, consistent in captivation, consistent in adventure. The island is fast emerging as an irreplaceable memory bank and if you ever find yourself touring Australia, I’d urge you to slip away to Tasmania for a glimpse of her inexplicable, glamorously gorgeous and subtly distinctive regions as you won’t find it replicated anywhere else in the world. If I’d never made it here, my travels would forever have remained incomplete. Can you think of a better Fatman crossed the Pieman joke? Have you uncovered a museum of unimaginable brilliance? Fill us in by leaving your comments below.